Uncertainty in oil markets has led to see-sawing oil prices, as analysts await upcoming U.S. inventory reports. - Conventional oil production still accounts for the vast majority of output around the world. 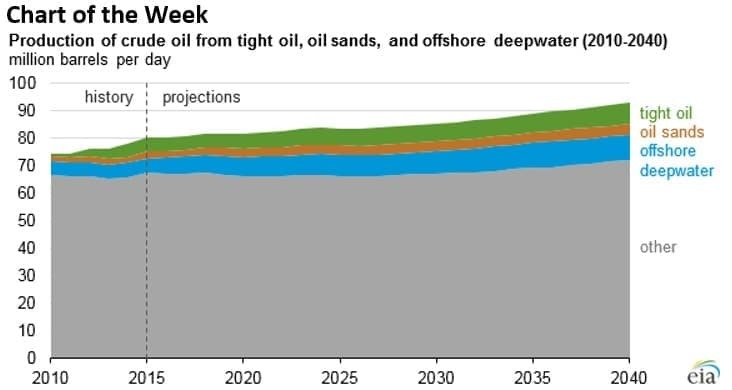 - But going forward, new supply will increasingly come from tight oil (shale), oil sands and offshore. - From 2010 to 2014, investment in tight oil, oil sands and deepwater jumped from 20% to 30% of total upstream investment. - By 2040, the EIA estimates that these three segments will account for 21 million barrels per day (mb/d), or nearly a quarter of the world total. • A U.S. appeals court ruled that a key natural gas pipeline could move forward in New York. The $900 million Millennium Pipeline Co.’s Valley Lateral project had been blocked by New York, but may now move forward, connecting shale gas to major markets. • W&T Offshore (NYSE: WTI) saw its share price jump nearly 6% after hours after it announced an agreement to jointly develop as many as 14 projects in the Gulf of Mexico over the next three years. • Golar LNG (NYSE: GLNG) announced the startup of its floating LNG project in Cameroon, only the world’s second floating LNG project. Gazprom will purchase the output. Oil prices were flat on Monday before rising and falling on Tuesday morning. The uncertainty in markets is sure to continue as analysts await more direction from the upcoming EIA weekly data release. 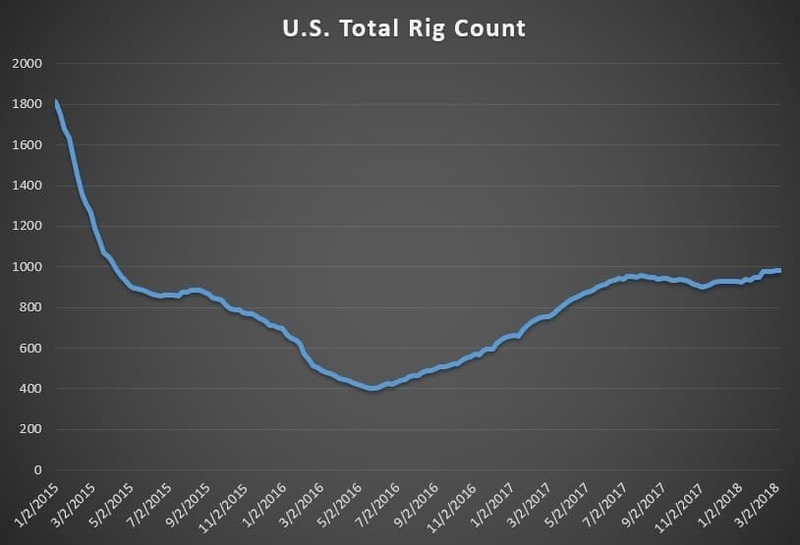 The dip in the rig count last week provided a jolt on Friday, but concerns about surging U.S. shale supply continue to linger. Saudi Aramco IPO delayed until 2019. The FT reports that Saudi officials are likely to delay the Aramco IPO until 2019, as they are struggling to push up the valuation of the company to $2 trillion. Separate reports have suggested that Saudi officials are aiming for oil prices to move up to about $70 per barrel before they stage a public offering, which would increase the value of the company. Some analysts even think that the international IPO won’t happen. “I would guess it is about evens that there will be no international IPO,” a high level source told Reuters, saying that the preparations for the IPO have been a disappointment. Meanwhile, Crown Prince Mohammad bin Salman will visit Washington on March 20. China energy/infrastructure spending slows. Bloomberg reports that China’s spending on its iconic Belt and Road Initiative dropped by 28 percent to $14.3 billion in 2017, as the government is looking to curb capital outflows. Hedge funds start shorting oil again. Last week, hedge funds and other money managers increased their short bets on oil futures by the most this year, perhaps an indication that investors are not convinced that oil prices will hold at current levels. The surge in U.S. shale production, which has forced forecasters to continuously revise up their expectations, is starting to weigh on sentiment. “The market’s entire focus is on these just amazing production numbers,” Bill O’Grady, chief market strategist at Confluence Investment Management, told Bloomberg. For the week ending on March 6, hedge funds and other money managers slashed their net-long position by 4.3 percent, which was largely the result of the 15 percent increase in short bets. Tesla temporarily suspended production of Model 3, but says output will increase. Tesla (NASDAQ:TSLA) has been bedeviled by production issues of its Model 3, and the electric car company said that it idled output at the end of February for a few days. But Tesla says the retooling will allow it to scale up production of its Model 3. The company is aiming to boost production to 2,500 units per week by the end of this month and 5,000 per week by June. Tesla shares rose by about 5 percent on Monday. Texas frac sand could lower drilling costs. Shale drillers in the Permian have had to purchase frac sand shipped from as far away as Minnesota and Wisconsin, and the tightening supplies as drillers increase the use of sand has led to cost inflation. However, with new mines set to come online in Texas, local frac sand could help cut sand costs for drillers by as much as 40 percent to 50 percent, according to a new report from Energent. The savings of roughly $500,000 could translate into lower total drilling costs by as much as 10 percent to 20 percent per well. Argentina to hold offshore auction. Argentina is set to auction off blocks in three offshore basins in the second half of this year, a move that will test the attractiveness of both the country’s geology and the dramatic economic reforms underway. Argentina’s leftist policies have typically deterred international investment, but the government of President Mauricio Macri has prioritized business-friendly reforms in the hopes of securing billions of dollars of investment in shale oil and gas. The offshore auction will demonstrate whether or not Argentina has shed the reputation of resource nationalism. However, scant offshore exploration to date will also be a major hurdle in attracting international companies. VLCC tanker rates plunge. First quarter rates for very large crude carriers (VLCCs) along key routes are on track to hit record lows and most ship-owners are losing money on every voyage, according to Argus Media. Day rates for VLCCs are hovering below operation costs, largely the result of a glut of supply of tankers. “The Mideast Gulf-east Asia VLCC assessment is on track to average just $6.80/t this quarter. This would be the lowest first-quarter average since at least 2006 and is just over half the $13.52/t first-quarter average logged over the past ten years,” Argus Media wrote.